In 1844 this property was advertised for sale and was at that time occupied by Mr. William Phipps. By 1851 this was the home of a gardener, widow Mary A. Witts or Mills. In 1881 master bricklayer Azariah Herbert was living here. Born in Bisley in 1822 he was the son of Solomon and Esther Herbert. He married Elizabeth White in 1844. They lived here with their married daughter and her two children and the couple’s two sons, both apprentice bricklayers. Azariah died at the age of 59 and his wife died four years later. In 1890 the property was advertised for let as suitable for a Boot and Shoe Maker and Repairer, the previous tenant having been the late Mr C. Hemming, who carried out this trade here. By 1891 this was the home of confectioner Charles Lovesy. He was born in Cheltenham about 1837 and married (we think) twice. His second wife whom he married in 1883 was spinster Rose Maria Brown, a mantle maker born in Cheltenham some 10 years younger than her husband. By 1911 Charles and Rose had moved to Cardiff. The next known occupier of 2 Thirlestaine Place was Mrs Elizabeth Vincent who was here at the start of the 20th century. She was born Elizabeth White in Cheltenham about 1837. She married Thomas Vincent in 1869 and they had a daughter in 1871. Sadly Thomas died aged 32 in 1877 so Elizabeth had to support herself and a young daughter. She became a lodging house keeper in nearby Andover House before moving to Thirlestaine Place as a tobacconist and confectioner . She traded here until about 1910, presumably then retiring. She died aged 83 in 1920. The confectioners shop was taken over by Mr James Arthur Stibbs. Born in Nailsworth about 1884. By 1891 he had became a hairdresser . He married Annie Elizabeth Organ from nearby Upper Norwood Street in Cheltenham in 1910. After the Robinsons had left the shop it again became a confectioners. Mr William Fisher and his wife Ellen were married in 1912. They lived over the shop which was also a tobacconists. The Fishers were here for about 35 years. During the 1950s the shop was taken over by Mr Walter S Eaton. In 1961 the shop was the home and business of Mr Cyril Gravenell and he and his family lived here until 1974. Like those before them, Mr and Mrs Gravenell looked after the ice-cream lovers and an wide variety was on offer. 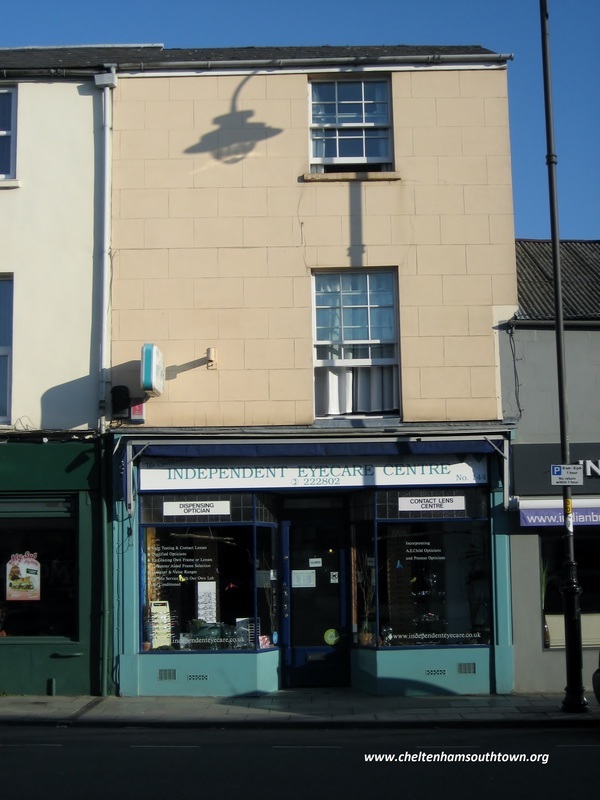 After more than 75 years of confectioners this building became the business of optician Anthony E Child and remained as an opticians until the present day.